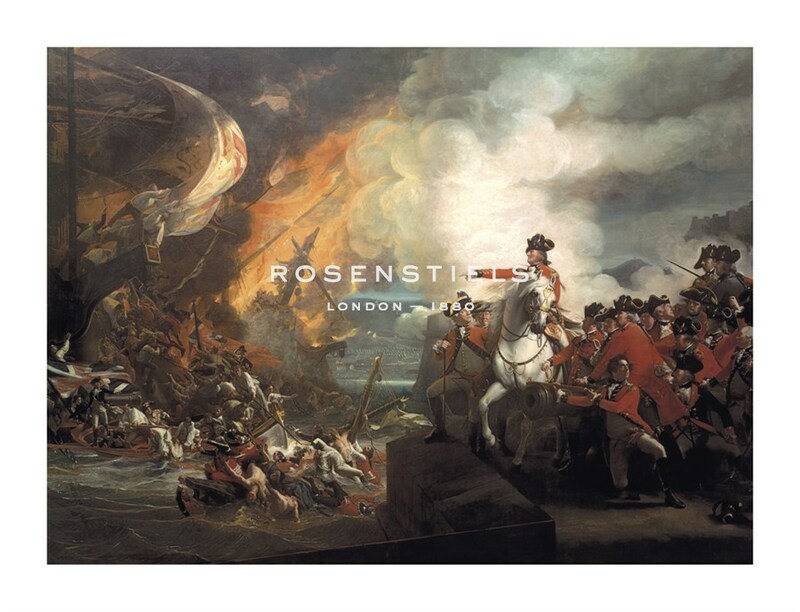 One of the largest oil paintings in Britain, this work was commissioned by the City of London in 1783 to honour the famous victory over Spanish forces some months previously. Interestingly, the artist chosen to portray this inspiring national triumph hailed from the newly independent United States: John Singleton Copley had left revolutionary Boston for London in 1774. This painting hung in the Common Council Chamber at Guildhall until 1886, when it was transferred to the newly-built Guildhall Art Gallery. It escaped the unfortunate fate of many of the gallery’s other paintings when it was transferred away from London just three weeks before its former home was destroyed by German bombing in 1941. The painting returned to general display only when the Guildhall Art Gallery was rebuilt in 1999: it had not been possible to find a wall large enough to accommodate it. It is now the centrepiece of the building’s largest gallery. The Great Siege of Gibraltar was the scene of one of Britain’s most striking military achievements of the eighteenth century. The siege began in July 1779, when a combined Franco-Spanish force initiated its assault on the British garrison at Gibraltar, a peninsula of critical strategic importance. The struggle was to continue, with merciless bombardment of the vastly outnumbered British force, for more than three years. The climax of the conflict, and the point at which it turned in Britain’s favour, is depicted in this work: on September 13, 1782, the garrison of around 5,000 men was attacked by a force twenty times its own size. Marshalled superbly by their commander George Eliott (portrayed here on horseback, leading his men from the front), the British troops successfully withstood the assault. This remarkable victory, stunningly depicted in Copley’s renowned painting, ensured the retention of Gibraltar, which remains under British jurisdiction to this day. One of the most interesting figures in the history of American art, John Copley was born in Boston in 1737. With English and Irish ancestry he was a typical product of 18th Century America. Tragically he lost his father in the year he was born and raised by his godfather, Peter Pelham, from whom he imbibed his initial artistic principles. From there, Copley was practically self-taught, yet he evolved a distinguished and direct portrait style with which he painted his New England clients. With such success behind him, Copley left America for good in 1774. He roamed Europe, visiting Italy and other Mediterranean countries, but settled in London where his style altered profoundly. He developed a fierce competitiveness and rivalry with one artist in particular called West, which became a bitter lifelong feud. Copley died a vindictive and jealous old man in London in 1815. Despite his famous grand manner, Copley's portraits of Georgian subjects have a delightful vivacity about them. His oeuvre is also notable for containing the first large pictures of contemporary history and the grand scale genre subjects of a type later common in France during the Napoleonic period and the Romantic movement. Copley's work features in many prestigious international collections.